I got an email today asking about Daniel Brito's music from the UE credits (and first sim mission). Since Daniel Brito already has the music available from his website, but not in MP3 format, I decided to put it up on the downloads page. While I was at it, I also reorganised the downloads page a little, as well as refreshing the links page. Today, the Wing Commander CIC turns seven years old. And I find it disturbing that the last news update here was about them turning six years old... but then again, I'm sure it's of no surprise to anyone that with all the work on Standoff, there's no sign of UE2 (and there probably won't be afterwards, either). 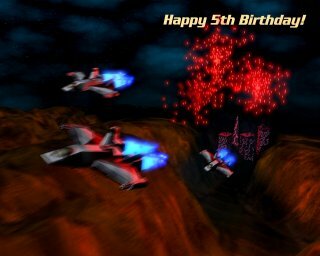 Today, the Wing Commander CIC turns six years old. All things considered, it is really quite amazing that the CIC has not only endured this long, but in fact continues to improve every year. It's pretty much safe to say that the WC community would have died long ago if it wasn't for their work - we're just sorry we haven't provided them with too many updates to report about this year. Now, unfortunately, we haven't got any new wallpapers or ships to offer as birthday gifts today. However, we do have something else that we've been promising for quite a while - the UE source code! You can find the source code package on the downloads page. There isn't much we can say about how to use it - you should have no trouble compiling it if you have experience with WCP Pascal... and if you don't, then you probably won't look too closely at the source anyway ;). Well, it turned out that the fixed version of the v1.02 patch was still not quite right. I guess this isn't really surprising, as I never really bothered to test the changes myself (it seemed a pointless thing to do, for such small changes... oh, well :p ). So, I've uploaded a new version. This version fixes two things - or rather, it fixes one thing, and attempts to fix another. The first thing is a small issue with the in-flight cutscene in M9A/B. The second thing is an ancient problem in M3A/B, where sometimes the mission would end at Beaufort even though it wasn't supposed to. I don't know if I managed to fix this one - I have never encountered this bug myself, I've only heard from about three or four people who have, and none of them were able to replicate the bug. So, all I could do to fix it was to go through the mission code bit by bit and change the bits that seemed like they might be responsible for the problem. Don't forget to let me know at the forum if it turns out I screwed something up in the process ;). Once again, the file is on the downloads page. Installation is the same as with the last two versions of the patch - extract uemiss.tre from the zip file and place it in the folder where UE is installed, overwriting the old uemiss.tre. And once again, the patch should be compatible with savegames from previous versions. As it turned out, the v1.02 patch caused some trouble - mission 8A would crash on startup, and mission 5B would crash at the second navpoint. The good news is, I believe I have now fixed the problem. A new version of the patch has been uploaded. As usual, you can find the file on the downloads page. Installation is the same as with the previous version of the patch - extract uemiss.tre from the zip file and place it in the folder where UE is installed, overwriting the old uemiss.tre. Like before, the patch should be compatible with savegames from previous versions. Don't forget to let us know at the forum if you run into any trouble with it. Long overdue indeed. Back in December 2002, I mentioned that a v1.02 patch was on the way, but would take a while because it's not a very high priority. Well, I don't think I expected that it would take this long ;). Still, the reason is simple - the changes introduced in this patch are so insignificant that the patch really isn't especially important. So, we simply never got around to doing it :p.
So, what are the changes? Firstly, capships are now labeled better (so, you fly from the BWS Dauntless, rather than the Dauntless). Secondly, it is now actually possible to run away from the Squids in mission 9 without sitting there for half an hour (at least in theory - I didn't bother testing the mission :p). And finally, some spelling mistakes were fixed here and there (only in the game, not in the fiction). Anyway, you can find the patch on the downloads page. Installation is pretty easy - just extract uemiss.tre from the zip file and place it in the folder where UE is installed, overwriting the old uemiss.tre. Well, in what seems to have almost become a tradition since the completion of UE, here's another news update that really has nothing to do with UE2 progress. Last year, we mentioned that the Polish games magazine Swiat Gier Komputerowych was going to publish an article about us. We forgot to follow this up with a news update when they did indeed publish it (although Pedro posted about it in the forum, in this thread). In any case, looking through their January 2004 edition earlier this month, I was pleasantly surprised to see them mention UE again, this time in the context of a more general article about computer game fans. If you happen to live in Poland, you can probably still buy this one. ...Sorry our lack of progress didn't give you too much to talk about for UE2, SGK! There is absolutely nothing substantial to put into this news update - there's no UE2 progress, and as for Standoff progress, you can read all about it at the Standoff website. So, the only reason for this update, really, is to wish you all a great New Year (even if our wishes are four days late :P ). I think this is going to be a very good year for us all, at least as far as WC is concerned. The Standoff Prologue is guaranteed to be released this year, and we're hopeful about getting the main campaign done as well. Which means there's also hope for proper UE2 progress :). And who knows? If Origin's making Ultima X, there may be hope for a new official WC game yet ;). So, while the UE2 project continues to vegetate, the first anniversary of UE's release quietly slipped by. Hard to believe that it was already so long ago :). Anyway, we are still busy with Standoff, which is progressing nicely. So, not much to report for UE2. The plot has been kinda hanging where we left it a few months ago. 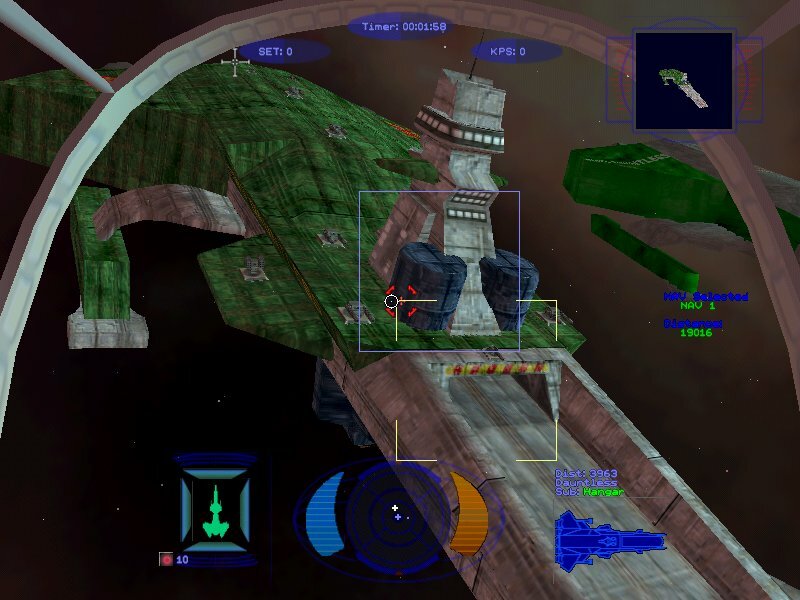 However, in the last few days, I have done some work on the new fighters for UE2 - that is to say, I've been writing out their development histories, and working out their stats (a process that includes repeated in-game testing). This is fairly trivial stuff, but it actually does help a bit with the plot - knowing how many of the new fighters are available helps to work out exactly what roles they will play in UE2. And of course, testing the stats is a lot of fun ;). In other news, Filler is developing a new website for us, in preparation for when UE2 development begins in earnest. So, once the new website is up, the news updates will probably become a little bit more frequent. However, we may also begin to release information about UE2 at some point before the new website arrives. So, in conclusion, we really are still alive :). First things first. 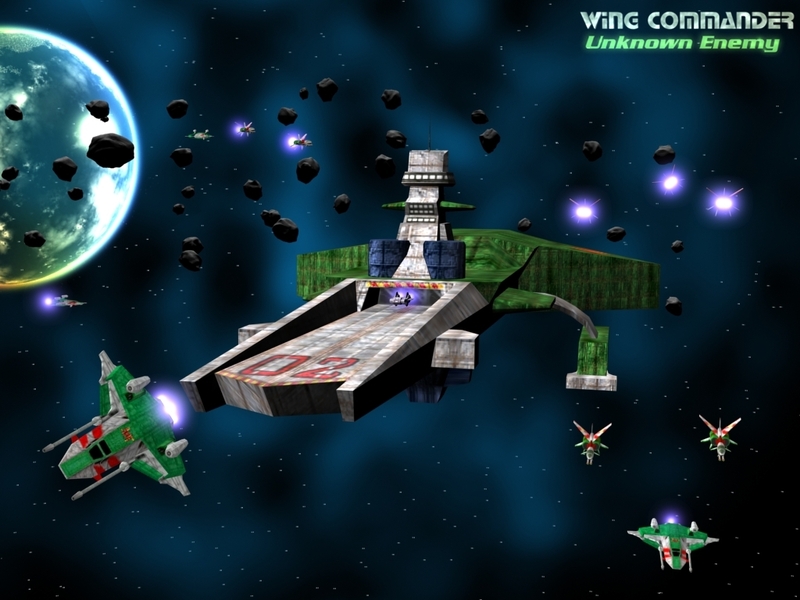 Unknown Enemy's complete package is now available for download once more courtesy of the Wing Commander CIC, thanks guys! :) You can find the file in the downloads section. However, it's unlikely that we will continue to host the split package from now on - it would take too much space. 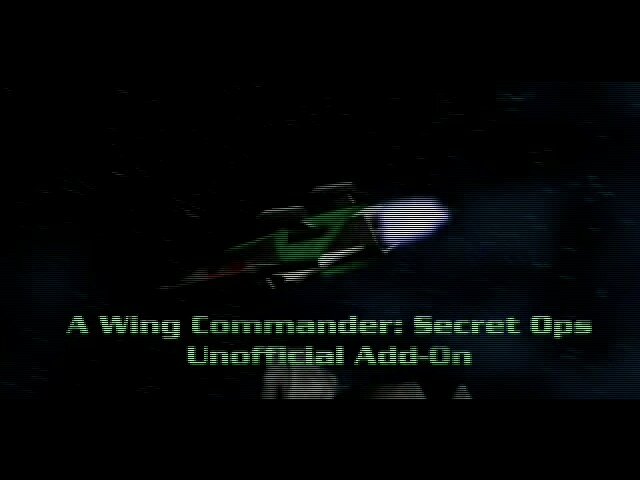 Anyway, I'm back on the Wing Commander scene now so expect to hear of more progress on the tutorials section and such. 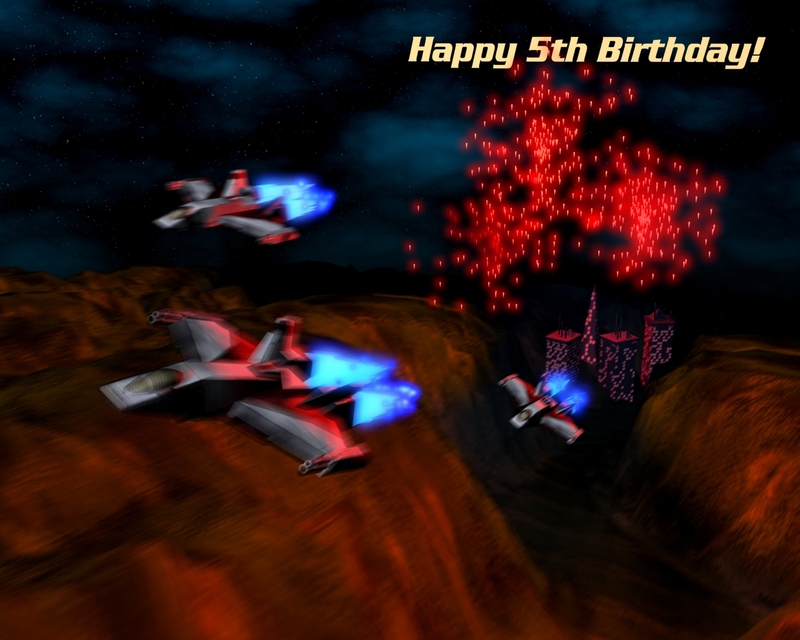 Well, today is the Wing Commander CIC's fifth birthday - difficult to believe it's been five years already, isn't it? :) Let's hope that they will be around for many more years to come, and that there will be many new WC games and fan projects for them to report about. To celebrate this special occasion, the UE Team has put together some birthday gifts - not just for the CIC, but for the whole WC fan community. Firstly, there is a short musical piece from Michael. It is a variation on that standard Happy Birthday song - but what a variation ;). You can download it here. The second gift is a new wallpaper from Rylex, which is shown below. You can download it here, or by clicking on the image below. 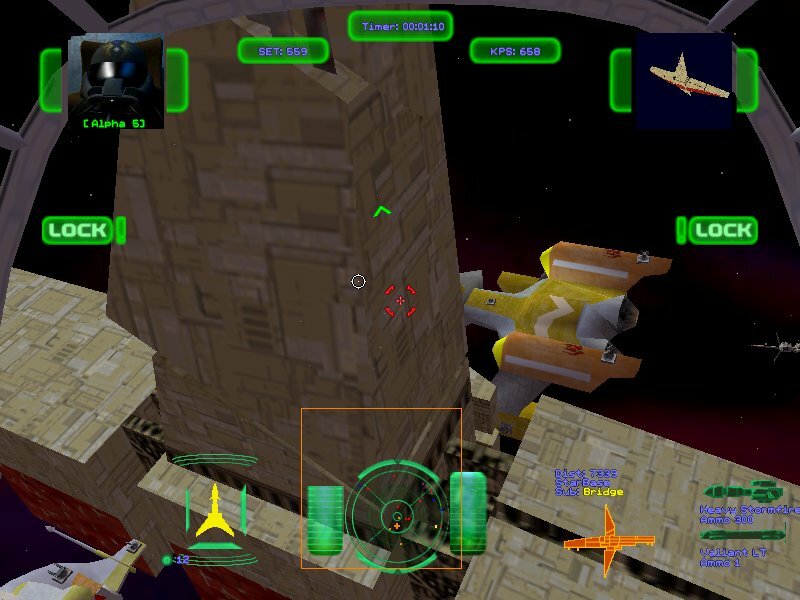 The ships, by the way, are Spectre-class light combat fighters, designed and made by Eder. 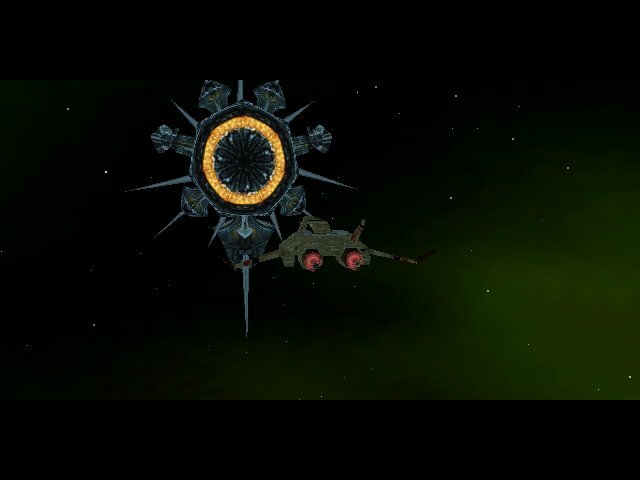 You will see much more of them in UE2 ;). Ok, it would appear as though every single one of our mirrors is currently down - TyeDyeBoy, who hosted two mirrors, is no longer able to do so, and this is presumably also the case with Antix's the nolimitclan mirror. Needless to say, we are extremely grateful to both TyeDyeBoy and Antix for hosting us this long. We are now working on getting UE uploaded elsewhere. If you can help, please contact us. In the meantime, if you wish to get a copy of UE, send Pedro an e-mail with your postal address, and he will send you a CD copy. There are still, by the way, other files like wallpapers and such, on the downloads page, so if this is your first visit to the UE site, it's still worth checking out. ...Hasn't it? But yes, we are alive, and we are still here. It's just that at this stage, UE2 is pretty much on hold, because we're concentrating our efforts on Eder's Standoff project. I do, every once in a while, work on the UE2 plans a bit, but between university, Standoff and life, you can imagine there's not much time left for it. On the bright side, Standoff is continuing nicely. All the outlines have been finished for a good while now. 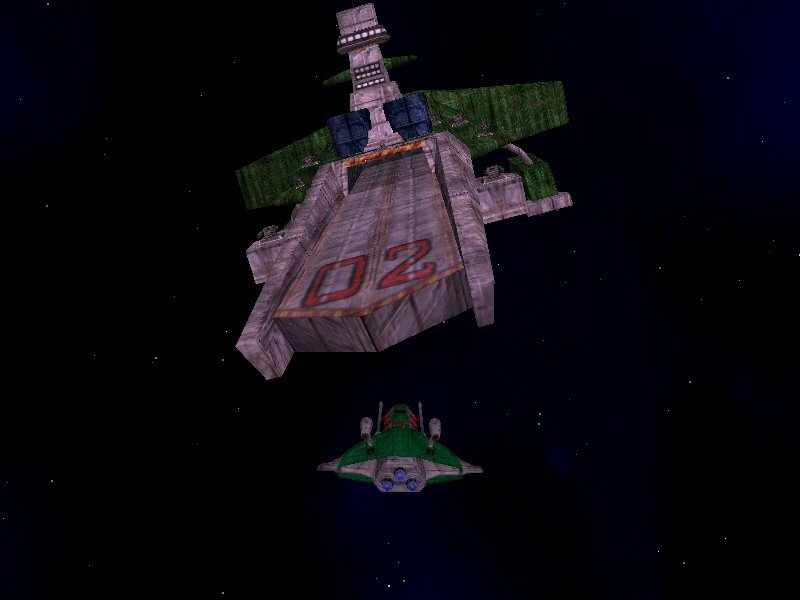 Missions one and two are being polished up, most of the intro has been coded (and looks better than I ever expected), and Eder's churning out new ships like there's no tomorrow. But I guess you can get Standoff news from Standoff's own news page ;). A few days ago, Rylex sent us a nice surprise - an image that can be used as a label for the actual CD. It's rather neat. As usual, you will find it in the downloads section. No UE2 news this time, I'm afraid... Eder's Standoff project continues to keep us busy. The great thing about helping out with Standoff, however, is that it gives us a chance to experiment with mission designs and campaign structures. I have no doubt that UE2 will ultimately be better off because of our work on Standoff... and not just because working on Standoff guarantees a continuing flow of models from Eder ;). Well, there's several things to report on. The most exciting news (for us, at least) is that TyeDyeBoy's two mirrors have apparently had almost 20,000 downloads of UE since its release in October. Some of these would probably be broken downloads and such, but it still adds up to a lot more than we really anticipated, and there's still a third mirror for which we don't know the number of downloads :). Secondly, the online FAQ has been updated - Mario Brito is reporting that it is possible to get WCP/SO (and therefore, UE) to run in Windows 2000. See the troubleshooting section to find out how. We're not sure if this solution works on all computers, so if you can try it, drop by the forum and tell us how it went ;). The third news item is about Michael's MIDI pack. This pack has been available for a week or two from the downloads page, but we hadn't reported about it earlier. Finally, an obligatory UE2 update ;). Michael has recently completed the UE2 theme, which will most likely form the backbone of the intro music... well, once we have an intro :). The piece that he's created is really, really great. And in the meantime, while Eder continues to work on models of ships both new and old for us, some of us have started helping him out with his Standoff project. I'm currently preparing mission outlines for the Standoff Prologue, which will serve as a preview version to the complete Standoff. Pedro and Pete will be programming these missions... but of course, you can find out about all that from the Standoff site :). Well, the year 2002 is now behind us, and so is the voting for the CIC's annual Fan Project of the Year competition. And UE has won, third year in a row :). We're grateful to everybody who voted for us - thank you ;). I must say, personally I'm just relieved that we didn't end up facing this third competition with UE still unfinished. Two and a half years is enough ;). And UE2? No important progress to report. We are currently debating the question of what engine we should use - if you have any suggestions about this, why not visit our forum and tell us? There has been no updates about UE for over a month... yeah, we've gotten a bit lazy, but can you blame us? ;) Seriously though, we've all been pretty busy. Besides, it's only a few small updates that are needed. Firstly, we have some additions on the downloads page - DVD and CD cover art images. The DVD cover was kindly provided by Rylex, while the CD cover has been made by Karl Frank, our beta tester. You'll also notice that the information about the old UE music package has been updated - a few weeks ago, Jack Grimes, the author of the music, has contacted us. So, it's no longer by an unknown author :). We still haven't uploaded V1.02 of UE, but this is only a small update, fixing details that have no impact on the gameplay. In the meantime, if you are having trouble, you may want to check out the on-line version of the UE FAQ, which is a bit more complete than the one that came with the game. I'm afraid I don't have the time right now to translate the Polish article for you. It is nice to see that someone outside of the WC fan community has noticed us, though :). Another UE-related article will probably be appearing in the next issue of the Polish games magazine Swiat Gier Komputerowych. Modem owners rejoice! Version 1.01 of Unknown Enemy is now available not only as a full package but as a basic package also! The basic version is 17MB and the movie, speech and music packs are all available for seperate download over at the downloads page. And if you're wondering, V1.01 includes the fiction viewer fix. I've also temporarily removed the mirrors that still host V1.0 of Unknown Enemy. Ok, an update on the problems that have been encountered with UE. First, some people have reported not being able to run UE at all - it crashes complaining about not finding "enemy.srs". This is not really a bug - we simply forgot to explain that you must install UE in the same folder where you installed Secret Ops. This is the only location from which you can successfully run UE. The second problem is the Fiction Viewer bug (or Fiction Viewer catastrophe, really). The problem is that when the Viewer is run, you do not gain access to any of the missions - so effectively, you see no fiction. We are fixing this problem in two ways - firstly, we've created a small patch for people who already have downloaded UE. You can get this patch from the downloads page. Run it, install it to wherever you put UE, and the bug will be fixed. The other thing we're doing is building a brand new install package, without this bug. Naturally, we'll put up an update when that's done (and then we'll get onto the lite version). We've had many reports of the Fiction Viewer not working properly. While we should have a permanent solution to this soon, for now the separate viewer is available in the downloads section. It seems that UE and the Fiction Viewer work best when installed to the default directories, which are "C:\Games\Secret Ops\" and "C:\Program Files\WC Unknown\Offline Fiction Viewer\" respectively. The viewer.zip file will automatically extract to the default path if you extract it to C:\. This may or may not solve the problem but we ARE looking into it and will hopefully have a patch up for download soon. ...It's done. UE is finished. We did in fact get some last-minute bugs during the weekend, and some of them were very nasty indeed. Then we got some more during the week. But we killed them all. There may be one or two more bugs hiding in there, but most definitely nothing serious enough to delay the release any longer. Over the years, UE has missed more release dates than we can possibly imagine. The first one, I believe, was August 10th... 1999. The latest, of course, was last weekend. None of those happened, but today, UE was released. The whole team has spent the last few months anxiously waiting for this moment, and it is damned great to finally be able to speak about UE's release in the past tense! So, head over to the downloads page :). We really hope you will enjoy playing UE even more than we did making it. And, in spite of the various nightmarish moments, making UE was really a hell of a lot of fun ;). At the moment, only the full version of UE is available. However, if your connection isn't good enough to download the full version, don't worry - check back in a day or two for an easier-to-download version. Now that UE is finished, the frequency of news updates will almost certainly fall (at least, once the lite version of UE is up for download). The news updates will definitely not stop altogether - we are hoping to make UE2 at some point in the future. So, be sure to visit every once in a while ;). And don't forget - we want to know what you think about UE. If you find bugs that we missed, if you have any comments about what we should do in UE2, please drop by our forum, and tell us all about it. Well, anyway. Michael seems to have had a very busy week, but he just finished the music for the final scene today. Now we have to convert the scene into WCP, build the final release package, and test it for a few hours. Assuming no last-minute bugs appear (and there hasn't been any in the past two days or so... that's a positive sign), you may well see UE before the end of this weekend. Another update uploaded by someone else. This lack of uploading ability has been a fairly significant pain lately. But still, we're almost there. What progress? I've finished the soundtrack for Rylex' scene. Michael's working on the music for it, which shouldn't take long. We've also fixed several bugs which jumped at us out of nowhere, and the FAQ that will come with the release version of UE is almost ready. All in all, I'm 95 percent certain that this is the last pre-release news update. Stay tuned ;). The method of putting up these updates seems to get stranger every week. I had no time today to go to the internet cafe, so I'm sending this update by e-mail for somebody else to upload :p.
Anyway... plenty of progress. Rylex has finished his last scene (in fact, he did so just a few hours after I put up the previous update). I'm still working on the soundtrack - I had a busy week outside of UE, and this scene is pretty complex anyway, even if it's relatively short. Michael's finished the music for Hadrian's scene though, and the music for Rylex' scene is the only thing he's got left. Other than that, I have received reports of a rather significant bug in mission 10 which needs to be fixed (though other bugs may still be out there). We also need to write an FAQ, and put together the final release package. And yes, we know that we said mid-October, and it's already the 11th ;). We are, I can assure you, working as fast as we can. Well, I had to come to this internet cafe to upload a bunch of UE beta file updates, so I might as well do today's news update, too ;). So, what's been going on this week? Well, the testing has continued (Karl is back at it, so we've been getting plenty of feedback). As is to be expected, there's been several bugs that we didn't even notice while programming. Over the past few days, however, the number of bug reports related to missions has been steadily decreasing - a good sign :). Furthermore, yesterday I finished the soundtrack for Hadrian's second scene. Just as soon as Michael does the music for it, that scene will be completely finished at last. Rylex has also been making rapid progress with his final scene. He says he is hoping to finish by this monday. So how about that release date? Well, it still seems like we'll be able to release at the planned time. Everything is basically on schedule :). As always, if you have any comments, feel free to visit our forum :). We're continuing to squash the last of the bugs, and Rylex is working hard to finish his last scene. Although he did not finish it, as expected, in time for this week's update, the scene is 90% complete. All in all, we're well on track for that mid-October release. Stay Tuned! Don't forget to visit our forum and tell us what you think of the new HUD! Ok so mid-October isn't strictly a release DATE but there you have it, later of course than we had originally intended but not too far off now :). Well what can I say, people? This will more than likely be my last ever Unknown Enemy update, this time tomorrow I will be at my new University, and before I'm even thinking about coming home for a break we should have released. I'll still be online, I just doubt they'll allow FTP uploads. The music is now almost completed and integrated. Rylex has completed 4 out of 5 of his FMV sequences and the final one is well on its way to completion and should be ready in time for next weeks update. Missions are where they were last week, completed, there's a difficulty issue on one of the missions but other than that all that remains to do is to beta test them, unfortunately Karl is having computer problems, slowing down beta testing. First a quick note to say that Quarto is no longer able to upload to the website. He is, however, back online and unsurprisingly working on Unknown Enemy. This is the same position that I was in last year. Now, depending on whether my University this year blocks FTP uploads either myself or Popsicle Pete will be making the updates. With that out of the way here is the current position of the project. We're done, except for a few pieces of music and 2 pieces of FMV. This week has seen the completion of one of those pieces, as well as Mission 8's near-final version. Rylex is now down to the last FMV and Hadrian's last is done bar some sound effects, though unfortunately he may be too busy to add them. Since we have some extra time while we wait, another project has been undertaken, the creation of a Border World VDU. Some of you may be interested to hear that while my system has, like many, severe texel alignment issues with Direct 3D, these new tests seem to be free of the issue and we'll hopefully have a screenshot of this for you next week. I'll make a point of discussing this with HCl, maybe this will help him track down the cause and allow correction of the errors in Secret Ops and Prophecy. While Rylex and Hadrian are sick, at least there's one good thing happening: mission 8 is ready for beta-testing. This means that while there are still many thing far from finished, at least we now have (mission-wise) a full campaign to beta-test. Hopefully our friends Rylex and Hadrian will be able to come back and finish their work while we beta-test the missions. Sorry this update is going to be bad, and short. Hadrian AND Rylex have been separately hospitalised. Hopefully it's nothing too serious, however I don't really know much about what's happened to Rylex, a friend of his contacted me. Quarto is away until I believe it is the 11th, I've finally got a life to attend to; bad timing, I know, but it can't last too long :(. Michael is working hard on music, although I've heard nothing new as of yet and feel I must apologise for this non-update, we truly are really close to release but everything's gone funny all at once so give us a week to get back in working order. Well, this week has once again seen plenty of progress. We are very close to release now. I'm not going to give you a definite release date yet, but I'm convinced that we'll be finished soon. Now, for this week's progress. Firstly, that final cutscene I mentioned last week was finished. I'm afraid I can't post any screenshots from it, since it's the big finale and all that :p. In fact, there probably will be very few screenshots indeed from now on, since we're simply running out of new things to show (and that's a good thing). Other mission progress - Pete is proceeding to steadily de-bug mission 8. There probably isn't more than two or three days' worth of work left in it. I in the meantime have been debugging mission 10. I didn't quite finish, but this one also should be done in a day or two. Once those missions are done, we will be able to compile a beta package including all the missions of the game :). On the other fronts, Hadrian seems to have pretty much finished his second animation, except for the soundtrack. It's a very, very impressive scene, by the way ;). Rylex has also finished another scene, so he's only got one left to go. And of course, Michael is proceeding steadily with the music, though he's still got a few pieces to make. Apart from the stuff above, there's still a few small things that need to be done. Nonetheless, we are almost there :). Eh, I wasn't really gone for very long anyway ;). Since there already was an update this week, there isn't too much to update about today. Still, there's always something :). As Pedro mentioned in the update two days ago, Rylex is back, and making progress :). The scene he is currently working on should be finished soon, assuming everything goes right. Other progress this week was, of course, mission stuff. Heh, it seems that now that virtually every other aspect of UE is finished, our updates have become a bit monotonous :p. Anyway, Pete has almost finished mission 8, which is a rather neat mission. I'd tell you more about it, but then I'd have to kill you ;). I've also made some progress on the final in-game cutscene, but it's still far from finished. Hopefully it will be next week. Finally, as usual, a reminder about Pedro's WCPPas lessons... if you are interested, contact him. I know this is an early update but there's nothing to worry about, folks, except... we seem to have lost Quarto, he's gone and no one including me can remember where he said he was going (if he did) or when he'd be back (if he did), he's only been gone 2 days but of course in Quarto terms that's a lot. Anyway what I'm online to point out is the new forum, this time hosted by the CIC, and also to point out that I have started a new section, the tutorials, based upon the lessons I have been conducting with people interested in learning WCP Pascal. The tutorials section is far from complete at the moment, mainly because I've only done two of them with the group so far. The next thing that you should be glad to hear is that Rylex is back! And is progressing with the FMV as we speak, after the current scene there is only one more to go. Still no word from Hadrian on the final FMV though which is beginning to worry me as if there is a release date delay this will be the most likely cause. I won't have much time in the next week but rest assured that I shall fix the final few bugs in mission 10 and keep up with these tutorials none the less. Ah, another week with plentiful progress :). To begin with, Mario "HCl" Brito has completed yet another miracle - the 32-bit patch. Strictly speaking, the patch is still in beta testing, but there haven't been any new bugs reported in the last two or three days, so it seems just about ready. At any rate, using it with UE most certainly has a positive effect ;). This patch improves the game by fixing certain visual problems which appeared in 16-bit. These problems were the most visible with capships, which looked buggy from a distance (for example, the turrets often disappeared). The down side of the patch is that it can be quite taxing for older computers. However, like the higher resolution modes, the player will be able to choose for himself if he wishes to switch the patch on or not. 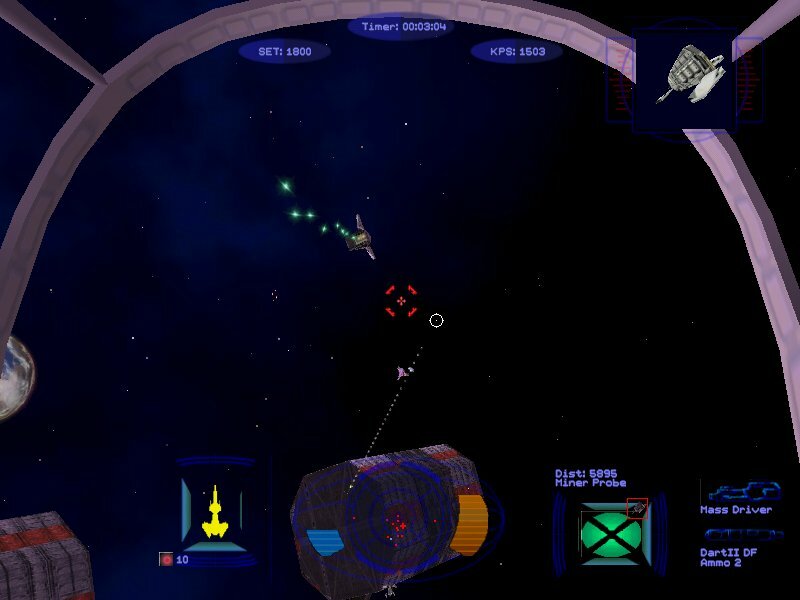 A side effect of this patch was the increase in capship viewing distance, and the increase in the number of asteroids that the game could show on the screen at one point. 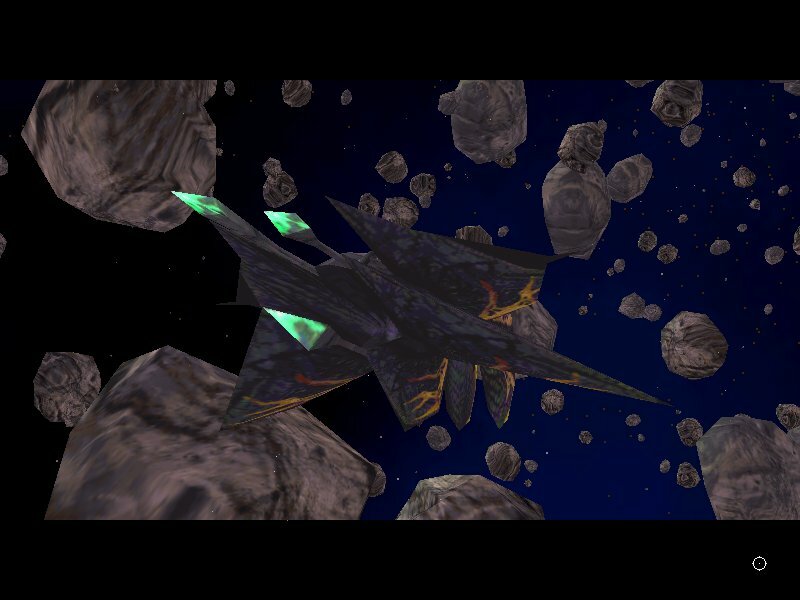 Originally, the game was limited to 100 asteroids at one time - this amount has now been boosted five-fold. Going on to other issues, I have finished missions 9A and 9B. I have also created (and finished) another in-game cutscene. Not much left, on that front :). And Michael has finished the music to another of the in-game scenes. Anyway, take a look at the screenshot below - it shows the scene that I finished this week. 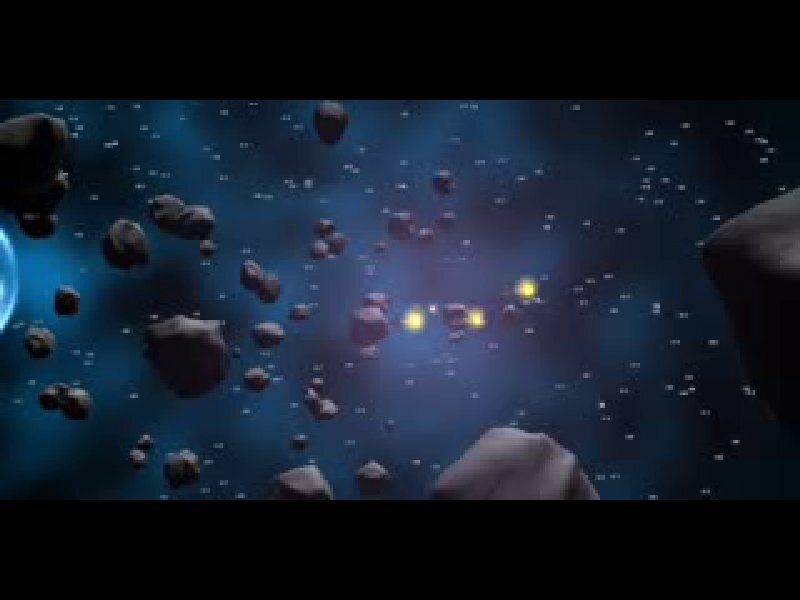 It also shows the effects of increasing the number of viewable asteroids. Still no progress from Rylex because he's still on holidays. He will be back in a day or two, though, which is most definitely a good thing ;). Finally, don't forget that if you are interested in learning WCPPas, Pedro is offering lessons - contact him for details. Ack, I really need some sleep :p. But there has definitely been a bit of progress this week :). Firstly, I've finished debugging another cutscene. Cutscenes are always a pain to debug, since they're much more complicated than normal missions - they're scripted in every aspect. This one, to make things worse, had been waiting for debugging for several months, so when I got down to it, I first had to spend a while trying to remember what the heck was going on ;). I'm also getting close to finishing the debugging of missions 9A and B. I would have in fact finished 9A today, but we discovered another bug elsewhere that had to be fixed immediately - the bug was present in a function used in all our missions, and although it only activated itself in very particular circumstances (that's how it got away for so long), it caused a total crash when it did appear. Highly annoying, it was :p.
Meanwhile, Mario continues to make progress on improving the WCP engine. As his website mentions, he's working on making the game use a 32-bit Z-buffer instead of 16-bit. This patch is not complete, but I can tell you that it does look rather impressive :). There will probably be more about it in next week's news update. Ok... no thunderstorms tonight, so it's time to post an update better than yesterday's ;). First up, the music. Michael Mahadeen has compiled a 5-minute medley using extracts from our mission music. You can find it on the downloads page, and you can comment about it at the forum ;). Michael has also finished another two music pieces this week - one for the in-game part of the intro, and one of sim mission 10 (SO originally had music for all but the last sim mission). Now, other progress. It seems that every aspect of UE is proceeding nicely this week, as can to a degree be measured by the amount of files I've had to upload this week just to keep the beta version up-to-date :p. I have finished debugging missions 7A and B, as well as one of the scenes that appear in the extro sequence. Mario has also done a lot this week, though there's really nothing unusual about that ;). Apart from improving the menu-centring patch a bit, he's added a few other patches including a few new mission programming commands needed by Pete in mission 8A. Rylex has been working on another animation for us, but now he's on holidays, so that one won't be finished at least for two weeks. The part of the scene that he's already finished, by the way, looks great. Meanwhile, though, Pedro has come back, and so has Pete. Hopefully, that will mean plenty of progress this week, too :). Well, no... this is a non-update :p. I have a good excuse, though - there's a storm outside, and I don't feel like buying another modem, so I want to get off the internet as fast as possible. Heck, going to sleep before 1 AM would be a nice change anyway. On the forums, I mentioned that we'd be releasing some more music this friday, that is, today. Obviously, that's not going to happen, but we will release it tomorrow. I'm sorry about this, but I'm afraid the weather's beyond my control :p. But anyway, expect a more normal update tomorrow - especially since this week, we had in fact made a fair bit of progress :). Well, this week's update is going to be shorter than usual... Pete is away this week, Pedro has been away since last week, and I've been away since sunday until yesterday. Rylex has been having some slight trouble with his computer, preventing him from working on UE cutscenes. All that means that there simply isn't very much progress this week in most aspects of the project. Fortunately, HCl has been able to salvage our honour by improving UE with another project of his :). Those of you who have used HCl's hi-res patch for SO know that the menus can look rather bad in that patch, because they don't take up the entire screen, and in some cases an ugly white bar appears in places that would have been off-screen on 640x480. Well, HCl has managed to fix these problems - although the menus still maintain their original pixel size on higher resolutions, they are now centred, so they look a lot better. Those annoying white bars are also gone, which certainly does help ;). Anyway, below you can see two screenshots, both taken in 800x600. 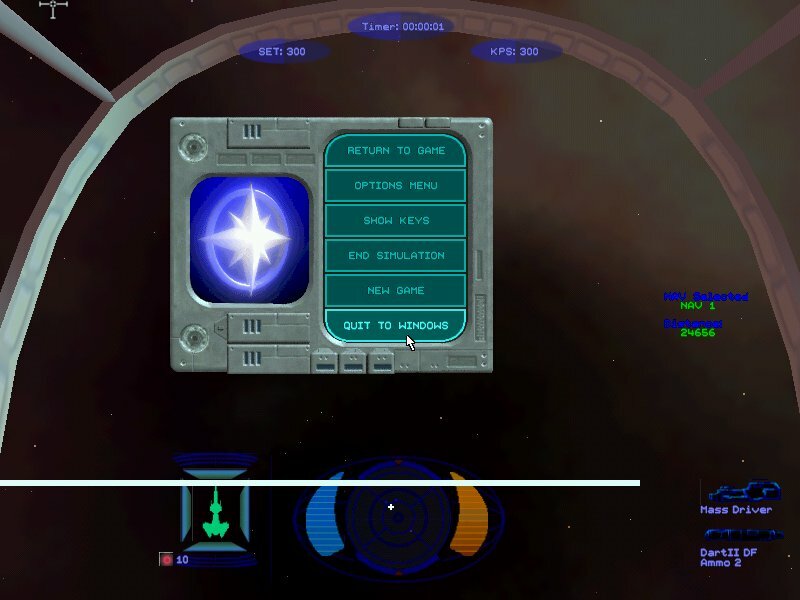 The first shows the in-flight options menu before the update, and the second shows what the briefing screen looks like once it's been centred. After starting the beta test last week, I was expecting a pickup in activity, but what happened seemed to go far beyond my expectations... which is a good thing, naturally ;). Possibly the best and most unexpected progress is the changes the UE DLLs have seen this week. 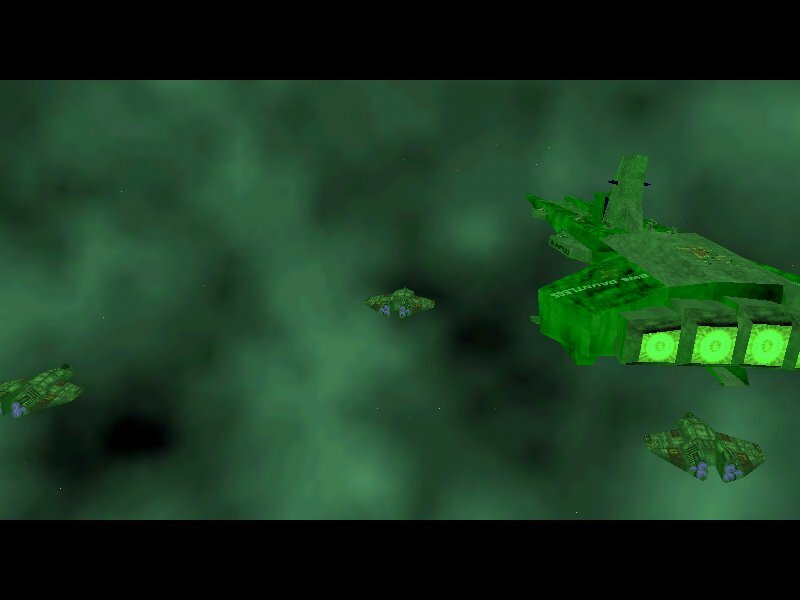 HCl has been able to break the VDU barrier (WCP and SO only allow a certain number of VDU images for fighters), allowing us to add the VDUs to the four of our ships that still used the generic 'buoy' image. HCl has also fixed a bug or two that had appeared in the DLLs the last time they were modified, and has implemented a command that allows the re-arming of ammo-based guns (normally, the game only allows the replenishment of fuel and missiles, not gun ammo). And, judging from the feedback we've been getting about the toughness of one of our missions, this command will definitely be needed ;). Meanwhile, Michael has finished the music for another two of Rylex' animations, including the intro. This allowed us to implement those two scenes in-game. Rylex himself hasn't been able to make much progress on other animations because he was too busy with real life stuff. He has, however, found the time to implement the front-end credits in the intro. You can see a screenshot of it below. The interlacing appears because this time the screenshot was taken inside the game, by the way. Well, this update will have to be enough for two weeks - this one and the last, simply because there is no point updating today and this friday. There just wouldn't be enough to talk about. Today, however, there most certainly is something to talk about. At long bloody last, UE has reached the much-desired point of starting a beta test! 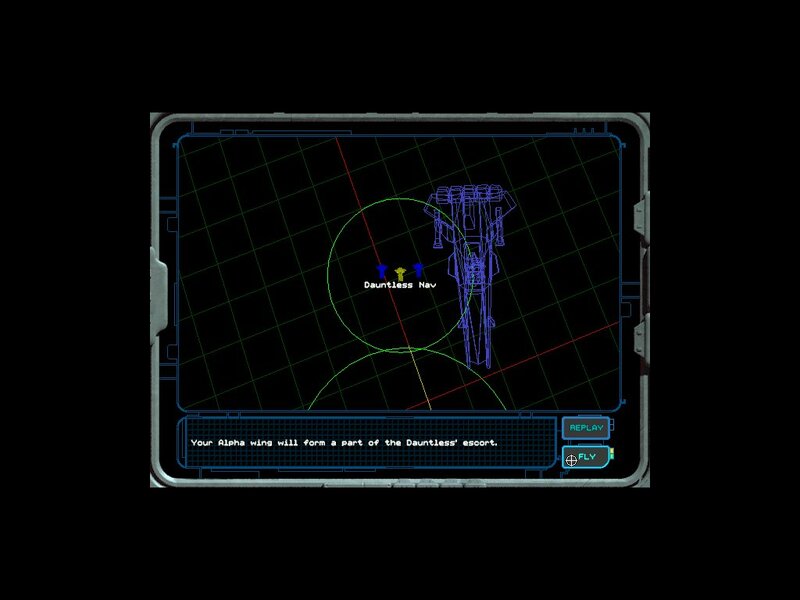 The beta only goes as far as the end of mission 6, but the important thing is that apart from two or three FMV pieces, that part is virtually finished. The rest of the missions are also getting closer every day. All in all, the end is beginning to come into focus, over on the horizon. The beta is a closed test, by the way, meaning that all the testers are chosen by us. In the meantime, most of the other progress comes from Michael, who has completed the musical score for Hadrian's first scene and for one of Rylex' scenes. Having complete soundtracks for those has allowed us to finally convert them to the game engine. Mission coding work also has not stopped, although it has slowed down a bit in these past two weeks (since I was busy putting together the compiled mission package for the beta). Pedro has continued to improve mission 10, however. He has also made one of the in-game extro pieces; that one isn't quite completed, but it's close. Finally, our forum really could use a bit more traffic, you know :). Well, this is a sort of "no update today" update :p. We're making progress, and we had in fact been expecting a rather significant update today, but we didn't quite finish what we were planning. Expect to hear something more in the next two or three days, though. Also, don't forget to drop by our new forum if you have any comments for us ;). There's so much to talk about this week, that I don't know what to begin with :). Well... the forum will be a good start, I guess. Thanks to WildCat, we now have a forum. So, if you have comments or questions about UE, head over there :). Next, voiceovers. They're done. All of them. That about says it all ;). Third, mission progress. Over the past week, we've managed to get 5A and 5B debugged. The latter, BTW, is a heck of a mission... too bad it's on the losing path :p. I've also almost finished debugging 7A. That one only has one or two more small bugs, but I didn't have time to finish the job today. Fourth... a few weeks ago, Eder said that he's working on a new Bengal model and asked if I want him to texture it as the Dauntless. Knowing at what standard Eder's work generally is, I certainly had no objections ;). Thus, we ended up getting a new version of the Dauntless. The old one was already beautiful, but this new one is better still. Just take a look at the first two screenshots below :). But what about the old Dauntless? Do we delete it? Certainly not! The old version of the Dauntless is not only neat, it's also a very historic model - this is the first model ever to have been converted by fans to a proper WCP capship, with components, turrets and all. That being the case, we have decided to release it :). You will find it over at the downloads page. And that's still not all for today :). Rylex has been continuing to make progress with his animations. Since we knew that we'd be showing the new Dauntless this week, we asked him to make a hi-res wallpaper based on one of his scenes (which, naturally, very prominently features the new Dauntless). You can see it in the last screenshot, and download it either by clicking on it below, or at the downloads page. Ok, so what do we have this week? We have some animation work, some voiceovers, and a bit of mission progress. Not as much as I would have liked, but then, I didn't have the weekend to devote to debugging. Firstly, we've got another role out of the way in terms of voiceovers. Definitely rather pleased with that, I am ;). That leaves one role to be recorded. It sure will be nice to be able to say they're all done ;). Hadrian has also provided us with another version of his second cutscene, but the real news as far as animations go is what Rylex has been up to. He finished the cutscene he was working on last week, and then he finished another one! Rylex' scenes are a lot shorter than the two scenes Hadrian is working on, but that doesn't make his pace of work any less impressive. Finally, missions. I'm still working on 5A. Much to my irritation, I found another unexpected bug today... but I believe I've fixed it. At least I hope so, because I haven't yet tested the mission since changing the code :p.
Anyway, stay tuned. Hopefully, next week we'll have even more to report about ;). I won't be able to update this friday, since I'll be away, so I decided to update today. And while I'm not quite satisfied with the amount of debugging I've done this week, we most definitely do have progress to report. Firstly, Hadrian has been making some very impressive progress on his second cutscene. There won't be any screenshots of that one, at least for now... we simply can't show everything ;). On the other hand, you can see below a screenshot from one of the animations Rylex is working on. It's only a short one (around 12 seconds), but it's looking very good. The screenshot below probably doesn't do it justice, since I can't show screenshots of certain parts of this scene either (and those parts happen to be the most interesting). Rylex is now busy adding the last finishing touches to this scene. Missions... well, like I said, less progress in this area, this week. I'm stuck debugging Missions 5A/B, not so much because of any difficult bugs but simply because I haven't had enough time to finish them entirely. ...But damned pleased with myself. I spent many hours today and yesterday working on de-bugging Missions 3A/3B, and they seem bug-free now. Earlier this week, I also de-bugged Mission 2B, and one of our game engine cutscenes. In short, we are making definite progress here. If you're wondering why the missions take so long to de-bug, well... take Mission 3A as an example. This thing, on average, takes about half an hour to fly from start to finish (don't worry - in terms of mission length, 3A is an extreme exception, not the rule). So, you fly through it, find a bug in the middle, fix it, and then fly through it again. And again. And again ;). Apart from that, we finished that last outstanding sim mission. There's a screenshot below, though it's not an especially exciting one. So, all the sim missions are done, including their descriptions. Finally, Rylex continues to make progress with the animation work he's been doing for us. Hopefully, there will be a screenshot of his work next week. So yeah, it's been a good, constructive week :). Well, to be honest, I had been planning to get that last sim mission done today, but didn't quite manage that, since I had to go somewhere. Ah well, it will most definitely be done by next week's update. Voiceovers have made plenty of progress. We are now down to two unfinished roles, and both of them have been assigned. So, once we get the voiceovers for them, we'll have that aspect of the project behind us at last. In the meantime, KillerWave has been busy converting all the voiceovers we got last week. Now that he's finished that, there is only one mission and one cutscene which don't have voiceovers fully implemented (because those last two roles, though assigned, aren't recorded yet). Maybe by next week's update they'll be done...? Still no new poll, because we couldn't think of anything to poll about. Maybe this week we'll think of something, but then, polling is hardly a big part of our job description ;). Other than that... well, the title of the update says it all. It is quite likely, however, that there will be a lot more progress to report in next week's update :). Well, my mailbox seems to be receiving voiceovers again :). It is great to see this - we are indeed very grateful to everybody that has, over the last few months (well, last two years), come forward to help us. Voiceovers are a nuisance for any fan project, because unless the project has a huge team indeed, they really can't be done internally - not unless you want five characters to be played by the same person ;). Anyway, of the three remaining roles, one has been definitely filled and hopefully I'll receive the lines in a day or two. Another role is about to be filled - I just need to decide which role I want to cast to this volunteer (not a big decision, when there's only two options). The third role will hopefully also be filled soon enough. So it looks like KillerWave will have some voiceovers to convert this week :). On the other fronts, there's been a fair bit of debugging going on this week. Pedro's been working on Missions 5a and 9, I've been working on Missions 4 and 5b. The sim missions aren't quite finished still - I need to write that last outstanding sim mission. Ironically, it's sim mission number 1 :). Finally, it would appear that there are some problems with the poll again. A mild nuisance, that... but then again, this poll has been running for quite a while already, and there isn't anything else that we urgently need to poll about anyway :p.
It is a good week for progress. Yes indeed, a very good week. Why? Because, mes amis, we now have mission music! Michael has finished the last piece for the complex MGI. Then we took all the other pieces he's done, put them together, and... well, it sounds great. Just like in WCP, the music changes depending on whether you're cruising, fighting, flying a damaged ship, attacking capships, and of course, if you have just won or lost the mission. Michael's next project will be to create music for Hadrian's cutscene number one. In the meantime, the sim missions have been proceeding exceedingly well. Last week, we had two missions finished and one almost finished. This number has now increased to seven missions finished, and two in final testing (difficulty balancing). One still left to do. Not too bad at all, methinks ;). There's been very little progress as far as debugging the campaign missions goes, but since we're running out of sim missions to code, I think next week there should be some progress here, too :). Still no new voiceovers.